It seems like everyone is getting in on the autonomous vehicle craze, with grocery giant Kroger being the latest to make a splash. 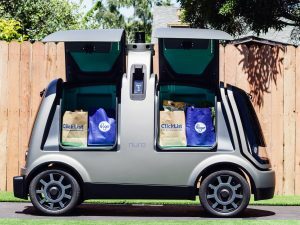 In a partnership with autonomous vehicle startup, Nuro, Kroger is testing out same-day and next-day grocery delivery order in Arizona utilizing driverless cars. The delivery fee is $5.95 per order with no minimum order which seems like it could pose problems down the road but that’s a conversation for another day. Currently, groceries are being delivered via Nuro’s fleet of self-driving Toyota Prius and Nissan Leaf vehicles with a safety driver onboard just in case, however that will all change in the future once the process is thoroughly fleshed out.